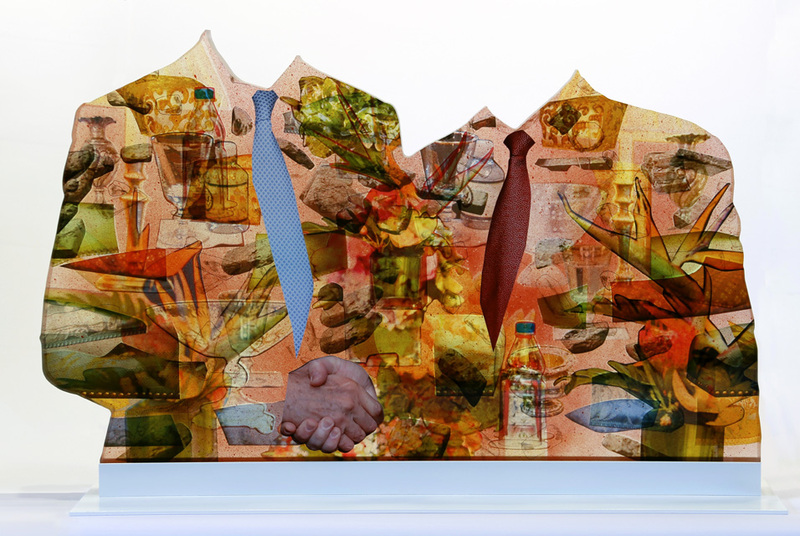 Anna Elise Johnson, Two Suits, 2016. 44 X 28 X 2.5. Acrylic, resin, archival digital print, india ink, spray paint. CHICAGO, IL.- Weinberg/Newton Gallery presents Sapphire, a group exhibition coinciding with the 2016 presidential election and leading up to the inauguration of the 45th President of the United States. This exhibition features the work of Anna Elise Johnson, Jason Pallas, Deb Sokolow, and Danh Vo¯, and is organized in dialogue with Common Cause Illinois, a nonpartisan organization that engages the public on such issues as voting and elections, money in politics, and the ethics of media and democracy. Organized around themes of civic engagement, from critique (or hallucination) of the campaign trail to investigations of how images are constructed and consumed, the artworks in Sapphire touch upon, elaborate, and divert from these issues through collage, painting, drawing, and sculpture. Certain works were conceived as democratic and invite direct interaction with visitors. Others depict parafictional narratives (a genre between fact and fiction), bureaucratic imagery, and national democratic symbols. Anna Elise Johnsons three-dimensional acrylic collages transform signs of structure, power, and control into abstract relationships. Through layering sourced images of governmental actors, affairs, meetings, tables, chairs, etc., the artist meditates on what she refers to as official imagery until color, shape, and space remain. These works remind us that as in politics, all images are constructed and wield the effects of their masters. Jason Pallas contributes gold monochrome wall works that invite gallery visitors to interact directly with his artworks, using coins to scratch through the surface. Underneath the gold coating, images appear that document landmark civic events, such as the March on Washington and Suffragette protests. Pallass artworks mirror the milestone historic events they depict as they depend upon participation to be realized. Deb Sokolows text-based drawings diagram, narrate, and project a series of events surrounding an imaginary Congressional election. The characters are based on real historical people, but the narrative she creates is fiction and does not align with their true lives. An exercise in ideological training, Sokolows parafiction encompasses youit implicates you and you respond accordingly. The campaign that develops operates on emotional and affective registers, in which seduction and deceit are parallel with hope and belief. Danh Vo¯ has affixed gold leaf to cardboard to depict the flag of the United States. In this application, Vo¯ elevates the status of his cardboard substrate, which is typically and easily discarded. At the same time, Vo¯ suggests, symbolically, that the U.S. could be accountable in branding its waste just as much as it is responsible for its goods and services worldwide. In reducing the number of stars on the flag from 50 to 13, Vo¯ reinforces the colonial history of the U.S. and implies that a colonial ideology may still reign.